Object-oriented programming, as the name implies, uses "objects" (data structures consisting of methods and data fields together with their interactions) to design computer programs and applications. Programming techniques include features such as encapsulation, data abstraction, inheritance, modularity, and polymorphism. Java, Python, C++, C#, Visual Basic .NET and Ruby are some of the most popular object-oriented programming languages used today. The Java programming language is designed especially for use in distributed applications on corporate networks and the Internet. C# is used in many web, desktop, and mobile applications. Object-oriented programming takes the view that data needing to be manipulated is as important as the logic required to do so. When data is combined with programming logic, an object is formed. Objects range from human beings (described by name, address, and so forth) to buildings and floors (whose properties can be described and managed) all the way down to the little widgets on your computer desktop (such as buttons, scroll bars, and more). 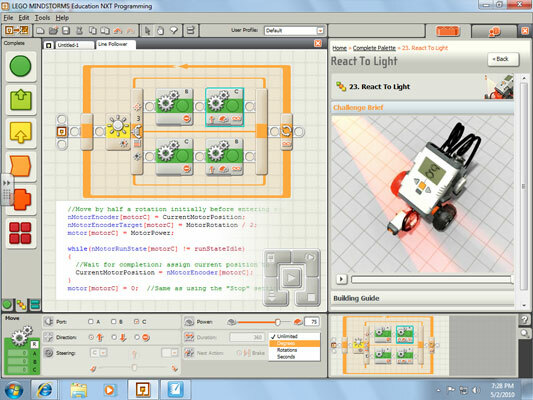 At Great Minds Robotics, we teach students the concepts of object-oriented programming by using LEGO® Mindstorms NXT robots and specialized programming languages like NXT-G, RobotC, LabView, and Kodu. Although some of these languages are procedural or object-based, they act as stepping stones to a summit consisting of real-world object-oriented programming languages including C# and Objective-C.
We realize all the above sounds like a lot for a five year old to digest. Fortunately we know the recipe to make programming fun and easy to consume. Enroll your child today so they can get a taste of a rewarding life.